In On My Own, Diane Rehm shares with readers her experience of early grief after losing John Rehm, her husband of 54 years. Rehm’s attempt to discover who she will be without her life mate offers up questions any of us might consider when faced with a loss of similar magnitude. How do we go on the first day, the next day, and the day after that? Do we opt for distraction from grief through busyness or do we allow ourselves to be steeped in memories and sadness? How does one get accustomed to being single at 78 when she’s been partnered since age 25? Rehm’s description of their early marriage paints it as traditional and sexist, recalling that she had to fight for a checking account of her own. “John was furious, feeling somehow threatened by the idea that the checkbook in my hands would create a kind of independence for me that he neither anticipated nor wanted.” Ironically, much later, after his diagnosis of Parkinson’s, John asked his wife to take over all the finances. This marriage moved from the grievances of stereotypical gender roles to a partnership that had to grow to accommodate dramatic change: a time when Rehm’s success in her career exceeded that of her husband; and later, John’s helplessness from Parkinson’s disease; later still, their mutual decision to move him into Assisted Living; and finally, his decision to end his life. This meant he had to starve himself, refusing water, food, and medication. It took ten harrowing days, during which his wife witnessed his difficulty and railed against a legal system that disallows agency for the terminally ill patient. Through all the difficulty, Rehm aimed to be a devoted wife, while also staying true to the independence and identity she worked so hard to build. For a woman who’s been called “the class act of the radio world,” (National Journal) this book is an extension of that class act. It’s honest, intimate, and self-convicting, while never slipping into self-pity or self-indulgence. Always a conduit—a place where voices come together to explore and inform—Rehm would never limit a contemplation on marriage, loss, grief, and widowhood to her own insights. By including so much of what she’s learned from others, she almost downplays her own experience. But it’s not out of secrecy or protection of privacy; it’s an act of graciousness toward us, her listeners. 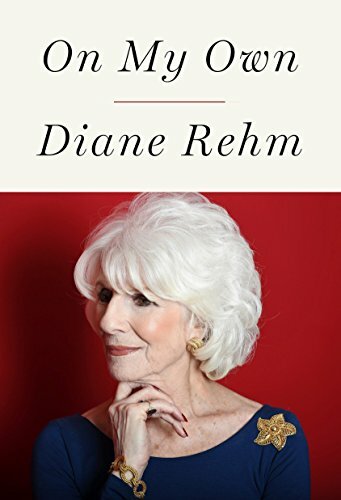 It’s an extension of the tag line on her website: “One of her guests is always you.” Diane Rehm is forever welcoming us into conversation, hosting us along with potent and prominent voices of our time. She has arrived where she is at this point in her life in part through the art of listening. So when she speaks, as she has done with the writing of this book, it’s always with deference. Some of the best quotes in the book come from others: Joan Didion, Roger and E. J. Mudd, Eleanor Clift and Tom Brazaitis, Jeff Stann, Susan Stamberg, and Isabel Allende. From Susan Stamberg who lost her husband Lou: “I wasn’t the most important person in anybody’s life anymore. When I go out for a walk, there’s no longer anybody in the world who knows where I am.” There’s a sad and stark brilliance in that observation. Fans of contemporary literary memoir will likely be disappointed by Rehm’s prose, written in a style that is formal and journalistic. The short chapters—many of them two or three pages long—have titles that are so obvious as to be unnecessary. Titles like “Fifty Four Years of Marriage,” “Grief,” “Christmas Holidays,” and “Planning for the Future” do nothing to enhance the work that follows. One-dimensional titles operate only on a literal level: This chapter will address the Christmas holidays. This one will address plans for the future. Considering how brief the chapters are, and therefore numerous, it’s just too many missed opportunities for subtlety and metaphor, for something more poetic or evocative. No chapter titles at all might’ve been more effective. Still, there is much to admire in the honesty and grace of this book: Rehm’s inclusion of unusual details, like how a cutting board can launch a wave of remembering; Rehm’s confession, “some of us are caregivers and I suspect I’m not one of them;” the simplicity of the line, “I cry when I’m alone;” and the heartbreak of the statement, “It is to him that I want to speak.” If it’s possible to have more respect for Diane Rehm than you already possess, this book will take you there. Staying busy has been a necessary survival mechanism since the loss of her spouse, but Rehm acknowledges she’s coming to the end of her broadcasting career. “It’s time, I believe, to have a younger voice in the ten-to-noon national spot. All of media is seeking younger people as listeners, viewers, participants. And by the close of 2016, I’ll be eighty years old.” She plans to work through the 2016 election. And she has plans for the good work she’ll do after retiring. “John always said it’s after the sunset that the magnificence appears . . .” No doubt Diane Rehm’s departure from broadcast journalism will be that kind of sunset: the promise of brilliance to come. Melanie Bishop spent 22 years teaching writing and literature at Prescott College in Arizona, where she was also founder of the national literary magazine, Alligator Juniper, and served as fiction/nonfiction editor for 17 years. In Prescott, she writes fiction, nonfiction, and screenplays, and has a coaching/editing/retreat business called Lexi Services. My So-Called Ruined Life is her first published novel.